The monochrom is a joy to use no matter the occasion. In fact, it sits in my bag next to my fully loaded Leica MP. 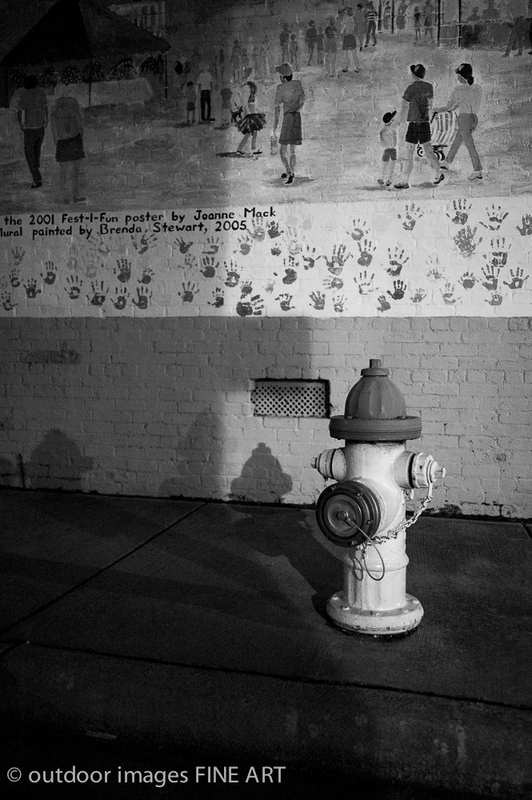 But something my black and white film work lacks that the Monochrom fills nicely is night shooting. Some refer to night shooting as long exposures under the stars. By night shooting, I am referring to hand-held night-time work. 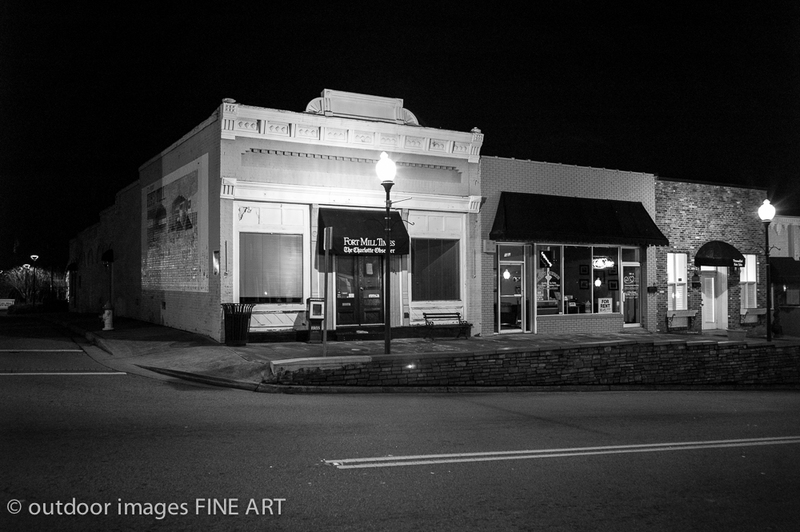 I have taken a good number of early morning photographs on Main Street in Rock Hill, SC using the Monochrom, M9-P and film. 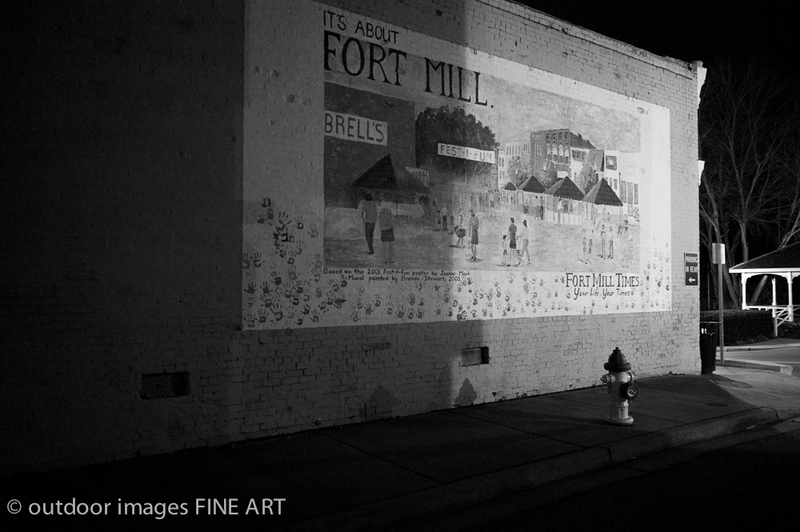 In this case, I was in Fort Mill and the night sky was clear so the street lights reflected off the buildings, leaving the sky a dark black. This contrast and the high contrast in the shadows presented a challenge for exposure. The Monochrom did its job living up to its ability for a large dynamic range in low light. The secondary beauty of the Monochrom is the seemingly low noise under high ISO. The first shot was made at ISO 3200 and the one above at ISO 5000. I use the term ‘seemingly low noise’ because noise is present regardless. However, the unique nature of the Monochrom sensor which has no bayer filter, means each pixel is derived from one light cell rather than an interpolation of three. Even better, notice the detail in the shadow areas. I used a new and still unfamiliar Gossen Starlite 2 in the zone system mode. Still learning because I’m not convinced this one has a manufacturing problem. I use the 1 degree spot to meter an area and select the zone (0 through X). Then I add other points and the meter shows which zone those points fall on and the average between the high and low point, or Zone V for that contrast level. Tonight, my second night using this light meter, I kept getting an Error reading. This only happened in the Zone mode, so I have more testing to confirm. Back to the topic, thought, the Monochrom captured some relatively sharp details and plenty of tonal values in this shadow to highlight range. The streetlights add a “glow” to the surrounding area. I call it “Street Glow” and it adds a luminous texture to the photographs. These images had a little contrast added and very little highlight and white increase. I left shadows where they were and deepened the black in all cases. This is a view from the front of the building facing the side street with the mural. Most of the time I end up loosing some detail with the Monochrom because a highlight in a more conspicuous spot was blown. I am getting better at taking a grey image and adding the black back while boosting some white just enough to keep details. The street scape above is also ISO 3200 the detail in the rock wall is just as strong as the detail in the highlighted building facade. These were all shot with a Leica Summicron M 28mm f/2.0 ASPH lens. While I still love the Elmarit M 24mm f/2.8, the 28mm is the full frame in the rangefinder and I find I can easily crop without needing help with an external finder. This keeps everything compact and easy to use. Shutter speeds at these higher ISO’s stayed between 1/30 second and 1/60 second. For a 28mm lens, this allows some handholding work. I recently acquired a Manfrotto carbon monopod, but declined its use here. For the pixel peepers, everything is sharp, even the 1/30 second shots. The results of the Monochrom here, in my opinion, are rich tones, contrast in shadow detail and highlight detail saved with careful exposures. Grey is good with the Monochrom because you can boost the white and deepen the black. While this is what we expect from a camera such as the Monochrom, I was pleased with the results in this tough lighting.